How Do You Fix the San Francisco Housing Crisis? Educate the People. 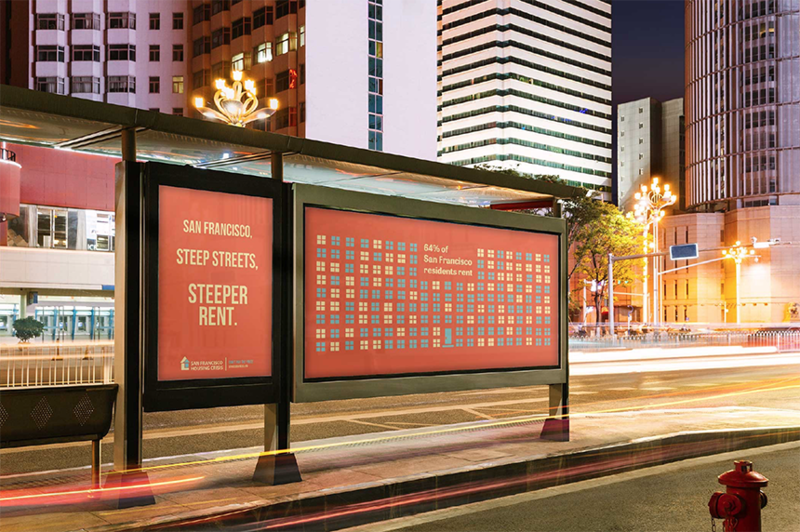 Over the past 10 years, the average monthly rent in San Francisco has more than doubled. For example, a two-bedroom apartment in 2007 would have set a renter back around $2500. Today, that same apartment costs upwards of $5000 a month. Residents believe they are powerless and suspect the massive tech boom and Mayor Ed Lee’s lenient tax breaks on these mammoth tech companies are to blame for the unsustainable rental market. This campaign and infographics, created by Marissa Mossburg with copy written by Max Reinhardt, is intended to educate residents on the roots of the housing issue and empower them through education. By educating residents on the unique ‘why’s’ and ‘how’s, the San Francisco Housing Crisis campaign will begin to shift a resident’s mindset from victimized to empowered. The goal is to get residents to understand that "the housing crisis is out of control. I didn’t realize I could be an active part of the solution." It is a smart solution for a city that needs answers.